I read and delete comments to my About page, since they’re always off-topic. Usually they’re derp material not worth reposting, but the other day, commenter Ari surprised me with a thorough reaction to the rumors of knee-jerk Glass bans. As a guy who’s dealt with both wearable tech and technophobes, I thought I’d repost it and respond. I read the recent article about Glass and the prospect of a ban. One way to mitigate the challenge that you rightly identify is the use of HUD like functions. However, more utility and less bling is what is needed. Ari’s referring to my AutoHud side project in which I connected Glass to my car, and ban on wearing HUD’s while driving. I built AutoHud to make a statement about Cecelia Abadie’s ticket, not as real Glassware. It’s very much a gimmick and has serious UX problems that make it unsuitable for on-road use. A serious app would grant powers beyond what your car already does – check your blind spots, warn you about driving too fast, verify that your merges are safe, etc. Perhaps the HUD interface needs lockouts to prevent distractions like Superbowl highlight while in motion greater than a specific speed. Sorry man, but I can never condone taking agency away from the user. A wearable is part of the wearer’s body, and how they use it is their prerogative. Imagine if when sidewalks were icy, your legs locked up to prevent you from running. Imposing moral limits into a product is as arrogant as it is patronizing. If an idiot crashes into you because he was watching The Big Game, sue him into indentured servitude. There’s also a subtle strawman here – an alert on Glass will distract the user’s eye for two or three seconds, but the same alert on a phone would distract their eyes and a hand for thirty seconds or more. Without Glass, users are distracted just checking which app fired the notification! Still, more important than lockouts, an app for optical enhancement of the field of view would be a deal breaker for a ban. Especially important in fog, rain or dark conditions, being able to get a better perspective of the road ahead would make Glass a safety device and not just a parallel system for existing and approved auto indicators. Lots of juicy points here. If you’re interested in wearables for optical enhancement, check Steve Mann’s EyeTap system. His wearable computer isn’t an app-running device but a visual enhancer that lets him see in HDR, stroboscopic, infrared, motion-filtered, contrast enhanced, and more. It’s worth adding that Glass’ form factor makes it a poor choice for this kind of app, but other systems could do it better. If a person would ban Glass, no app or feature would change her mind. These people are intrinsically fearful of conceptually different technology from the outset and seek out logic to defend themselves in arguments. They’re being driven by emotion, and emotion doesn’t react to proof. To undermine their ability to ban Glass, make it popular – when enough friends and family use it without killing themselves, the fear reflex will subside and cooler heads will prevail. Glass is already a powerful safety device while driving, since it absorbs so many digital distractions. Voice-activated GPS and music nullify two main reasons people take their hands off the wheel. The way it handles notifications is also life-saving. When a human gets a stimulus that may or may not lead to a reward, it creates tension that’s extremely hard to ignore. Being able to nod and “cut to the chase” disarms the tension and lets the driver keep his mind on the road. At the end of the day, banning Glass behind the wheel is shortsighted but fear-driven. An emotional problem needs an emotional solution. Keep writing apps and make Glass a product that people need, so the hand-wringers are surrounded by a reassuring crowd of productive users. When talking to opponents, rapidly and courteously end the conversation – there’s no reasoning with emotion. Just outrun them by getting their friends to wear tech. 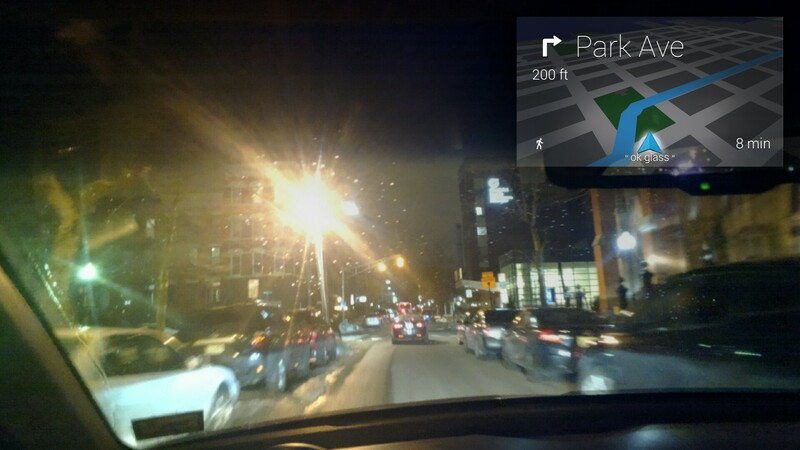 This entry was posted in Cyborg UX, Google Glass by Yours Truly. Bookmark the permalink.